Easy to use, hang-on-the-back skimmer. 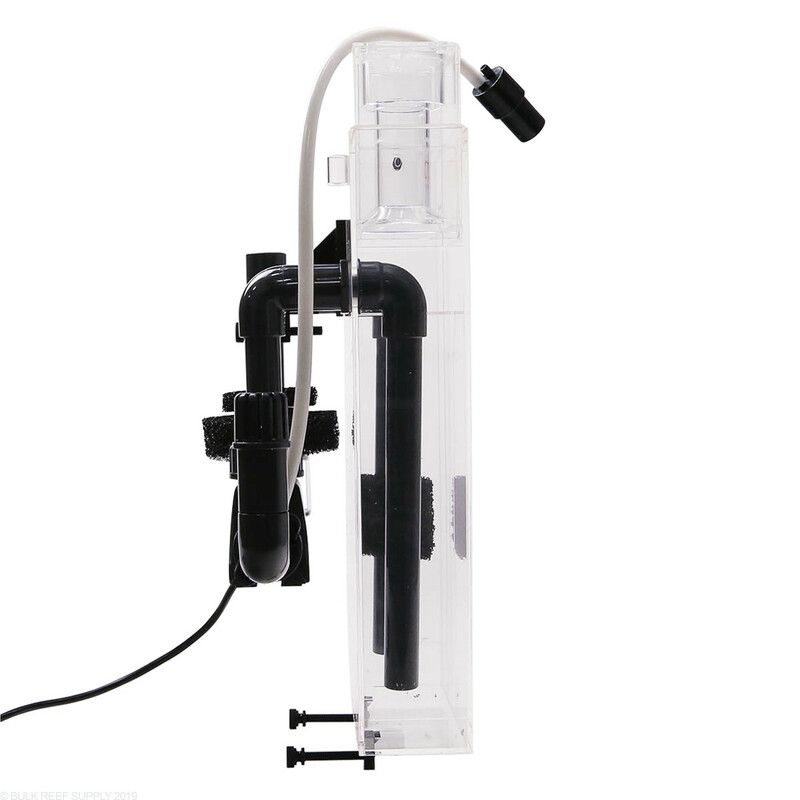 Hang the skimmer on the back of the aquarium, mount the pump in place per instructions and it is ready to skim. Powered by the 1 Aquatrance 1000 pump with high performance venturi injection system and pinwheel impeller. Built with high-quality acrylic. Dimensions: 8" x 3.25" x 17"
Seriously this skimmer is great. If you have problems with it, it is your fault. You literally put it on the back of the tank and plug it in and watch the skimmer cup over the course of an hour. Stop acting like every product is going to magic and just would without adjustment. Good skimmer for the price; build quality is great. I have had this skimmer for about 4-5 months now. I am very pleased with it. The shaft on the impeller is ceramic, so be very careful with it! I broke mine and had to replace it. It creates good skimmate and I can keep the cup at about the same level and keep getting waste out. My other HOB needed to be adjusted often. My only con about this skimmer is the big pump that had to be inside the display. With the performance of this skimmer (most important in my opinion) I'll deal with the eyesore. Easy to clean and assemble. And yes, the instructions are terrible, haha. 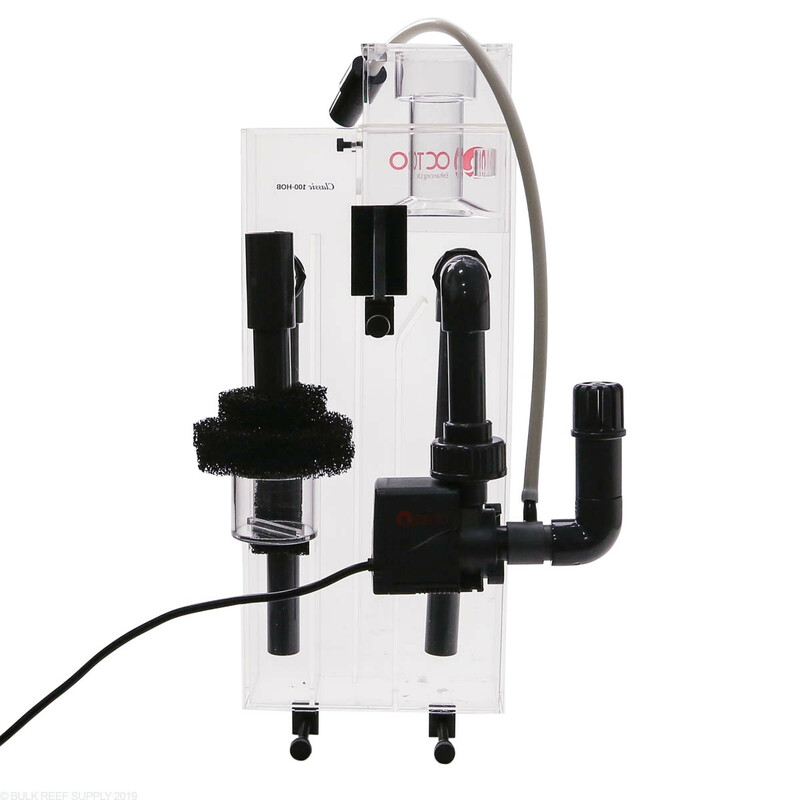 The major problem with this skimmer is that the sponge inside gets clogged and consequently the skimmer will overflow water onto your carpet or floor. This is a big problem that is not addressed in the instructions. Other hobbyists have said the same. The sponge inside the last chamber will get clogged and the water then will go out the top. Several other hobbyists have reported the same thing. I keep seeing people talking about break in time. How did you do it without water all over the floor? My cup fills up in minutes! Not sure if I could recommend it or not at this point. And the directions are pretty useless. After five or so years, many diy and store bought purchases (from tanks to Skimmers and sumps to Refugiums, this has been my best improvement yet. I started with a small Tunze 9004 in a 20 gallon Long and kept it when i moved to a 38 gallon and a ten gallon sump (scrapped the Fuge). Getting ready to buy a cuboid shaped frameless/rimless and build a stand to house my sump and ATO tank. This is one of the few improvements/changes before the tank comes. VERY PLEASED!! Easy to set up, allow for break in and see how the foam builds! Incredible performance, VERY quiet even compared to a tunze 9004. Much more powerful pump and a good sized collection cup. Should last a long time! 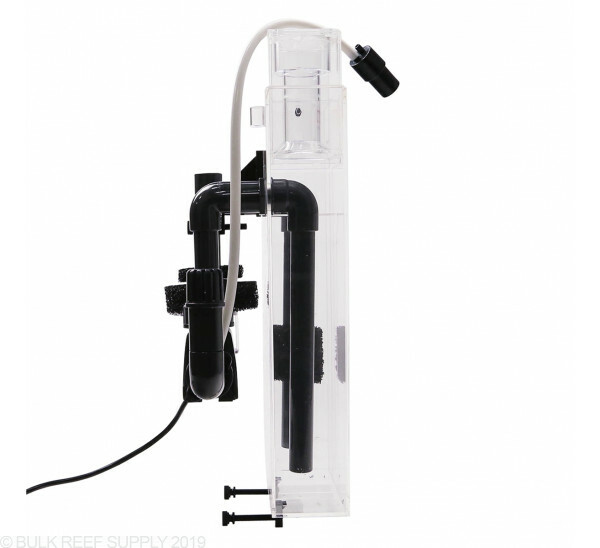 Bought this for my 30 reef as a temporary skimmer, It works very nice, think I will keep it! You must keep the cup above the overflow hole and correctly prime it for first run and then it runs by itself. Notes: Possibly a common error, but when starting this skimmer for the firs time, leave the cache can off, i had mine adjusted to the very bottom and water kept spilling over onto the floor. Place the cache can slowly moving it down further until you have no over flow. Overall, great product!!! Got this skimmer for Christmas! As soon as I turned it on it went crazy because I just upgraded and decided I really need a skimmer. Went from a 10 G to a 20L and have this on my 20L, it pulled decent yellowish/greenish skimmate as soon as I turned it on. Compared to the 10, the fish tank is lightly stocked (pair of clowns, six line wrasse, cleaner shrimp) and basically did a 50% water change when adding this skimmer. It is very quiet and still in the break in period so I hope the skimmate gets dark as said. I gave it 5 stars because it was easily assembled although the directions weren't that helpful but its well built and QUIET. Works great. Just let it break-in and fine tune it. Easy, easy, easy. Performs great and super quiet. I'll save you hours of research. This is a well built, relatively quiet skimmer. 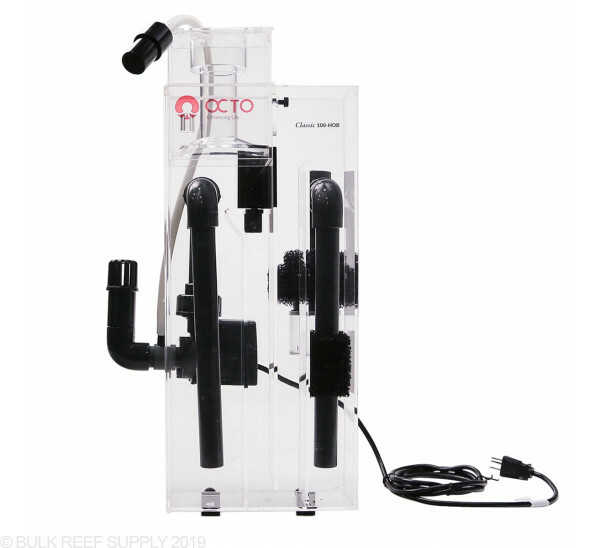 I was looking for a skimmer for my 50 gal breeder and I'm very happy with Reef Octopus's products. My only regret is not going with the 1000 or 2000, mostly because of the external mounted pump and 50 gallons seems to be the biggest tank I would put this on. Overall, a great product that does what it says. A great skimmer for someone who is still new to the hobby. I've only been keeping saltwater tanks for a little over a year and this is one of my best purchases, next to an RO/DI system. It took a little over 48 hours for it to break in and start producing a light skimmate. After a week I had some nice, dark skimmate being pulled from my tank. The only negatives to this skimmer are the directions and the in tank pump. Youtube quickly solved the directions problem and the in tank pump does take up some room in my 29gal tank, but the way the pump is set up it skims the top of my water which I really like! The only other downfall is the open side of the skimmer leading to the return. This just adds a little more to the salt creep and evaporation - but that's what top off RO/DI water is always for. Even with the few downfalls I still give this skimmer a 5/5 because of the quality build of the skimmer and how it functions so quietly. My old Coralife super skimmer was extremely loud and this skimmer is the complete opposite. After spending quite a few months researching skimmers for my new 45gal tank it came down to two models; the Reef Octopus and the Aquamaxx. After talking to some people on a few reefer forums, seeing a huge one up close at my local zoo, and chatting with a few LFS employees I ended up with this one. It was pretty easy to put together even though the instructions are a little useless. Once I got her up and running she started pulling things out of the water right away. I was having to empty the cup two-three times a day for the first few days. Now that its been about a week or so it's down to every other day or so. It's a very quiet skimmer. Just a little bit of noise when it first starts up. I think my Marineland filter makes a racket compaired to it. All in all though I am very happy with it! 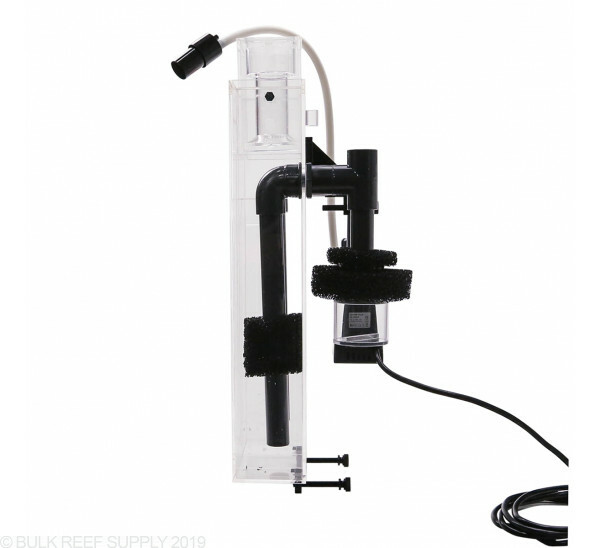 Can this be used with a 10 gallon sump that is located on the floor? I keep 10 inches of water in it, but I'm wondering if the powerhead would be fully submerged or not? Otherwise what else would you recommend? What is the footprint of the pump? 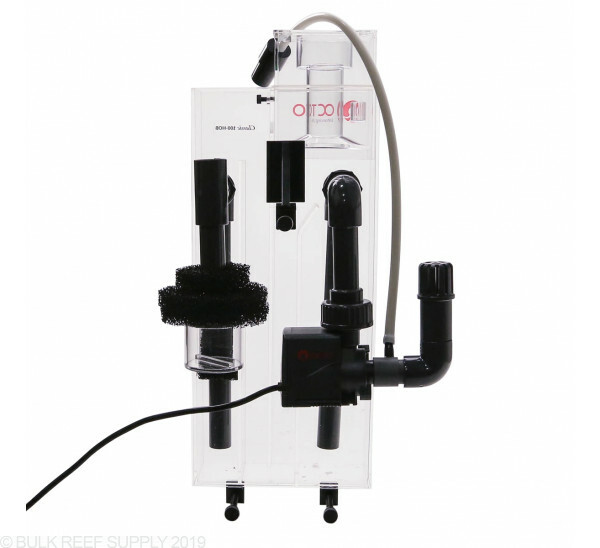 How much pump space is needed for proper operation? 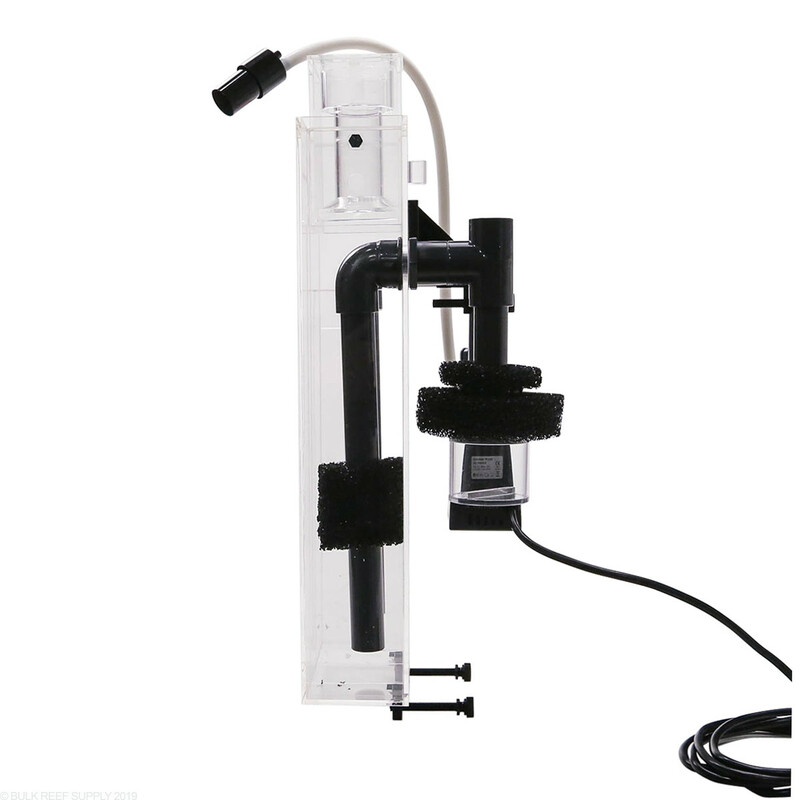 The pump on the classic 100 skimmer is 4.5" x 2.4" x 3.6". You would want to give it about 2 inches around the inlet of the pump. Hello i just oreded mine and im super excited im just alittle worried about the overflow ive been doing some research and i cant find anything on sertting it up so it wont over flow to my carpet do u guys have any videos on how to start it ? Overflow with hang on back skimmer is an inherent risk and will need to be set up under observation for the first several hours and possibly even weeks during break in. You essentially will move the o-ring on the collection cup to set the cup at its highest level. Once a day for the first week you can slowly lower the cup until the skimate is forming. Feel free to let us know if you have any further questions! Will this mount properly on a rimmed aqueon aqaurium? How much clearance would I need behind my tank? Also I have a 75 gallon lightly stocked only two medium size fish. Would this skimmer be a good choice?